RK Tek spent a better part of the 2008 Season developing a performance package for the new Rotax 800R(ETEC is the SAME ENGINE) Engine. NOTE: This 860R kit was designed and built FIRST by RK Tek in 2007! It is the "Original" It OVER 9 FULL seasons of testing associated with it. There are NO "Surprises", "Tinkering", Fiddling" or "Head Scratching" with this kit. It is a TRUE "Pull the Rope and Ride" Kit that WILL DELIVER the Performance ! ALL variables have become "known" after this many years of running this kit..
You WILL be 100% satisfied with this kit!! WE ALSO have this fantastic kit ready to go for the 800R ETEC!. Best Part: NO FUEL CONTROLLER REQUIRED. This kit is LESS expensive $1850 COMPLETE! The RKT 860R really benefitted from our custom Y Pipe. We will be able to offer this Y Pipe for all 860 customers. We will have a VERY limited supply on hand but should be able to get them made throughout the season. If you are interested in this custom Y Pipe, please contact us. NOTE: RK Tek was the FIRST to develop this 860cc big bore. It was developed in December of 2006 (remember the 800R was introduced in the 2007 Summit model only). Since its introduction, MANY other shops have also developed an 860 for this power-plant. While there, now, exists many 860cc Big Bore kits not all are created equal. Think about Pizza, You can get a Ham and Sausage Pizza from 1000's of Pizza Parlors and on the outside they will all look very similar.. BUT...once you bite into them, they will, most certainly, not taste the same. Same with the different engine kits, while they might look the same and have similar components (pistons etc. ), once you crack the throttle, they will not necessarily perform the same. So, in short, not ALL 860's are created equal. We, at RK Tek, take pride in our engine kit developments. We are the originators!! We are ,usually, ALWAYS the first to develop the over-bores for all Ski Doo Engines and couple this with our patented head chamber design, you have a winning engine package. 1)The added 600cc DOES add some power but it is NOT the main reason for the higher power output! There are several "players" in why the 860 kit surpasses the 180HP mark. This power is reached through EXTENSIVE porting, a VERY unique piston design, and a patented head design. These 3 coupled with the larger piston are what allows this engine produce this great power. 2) Adding more cc's will simply not increase the output by anything measurable, in fact, it MAY even lose power due to increased heat in the scavenged charge. In any case, like mentioned above, the REAL reason the 860 kit makes the power is the COMBINATION of the Porting (extensive porting is performed), Patented Combustion Chamber Design, and Piston Design. RK Tek has EXCLUSIVE rights to this piston design it can not be used by ANY other shop without our permission. It IS a KEY component in this kit. OUR BIG-BORE Piston is LIGHTER than the OEM STOCK Piston!! This allows the engine to run much better and extends the crank-shaft life! RK Tek spent a better part of the 2007-2012 Seasons DEVELOPING and PERFECTING a performance package for the Rotax 800R Engine. The new engine was torn completely down and inspected for deficiencies. It was not much of a surprise to find that Ski Doo had not addressed many of the problem areas that also plagued the previous Series III power-plants. Of course we are talking about the VERY inefficient combustion chamber (head) design and the “prone to heat soaking and ring failure” piston and ring combination. While Ski Doo did address the lack of engine/cylinder/crank-case (not head) cooling with their new engine… the “CORE” of ANY engine is the piston, rings, and head design and these components remained virtually unchanged. Since RK Tek is known for their unique and effective methods for “fixing” Rotax engine issues, this new engine was surely going to get the “full treatment” and get a “makeover”. This “makeover” came in the form of a new, dual ring, piston and a new billet head with a very efficient combustion chamber. Speaking of diameter…did we mention that the new piston is 85mm vs. 82mm? This turns the 800cc engine into an 860cc engine. While 60cc is not a HUGE over-bore in itself… that fact that the piston and ring design of this new piston is so much better than the OEM piston gives the 60cc increase much more merit. So, now, we have an engine with a MUCH better piston and ring design boasting an extra 60cc. 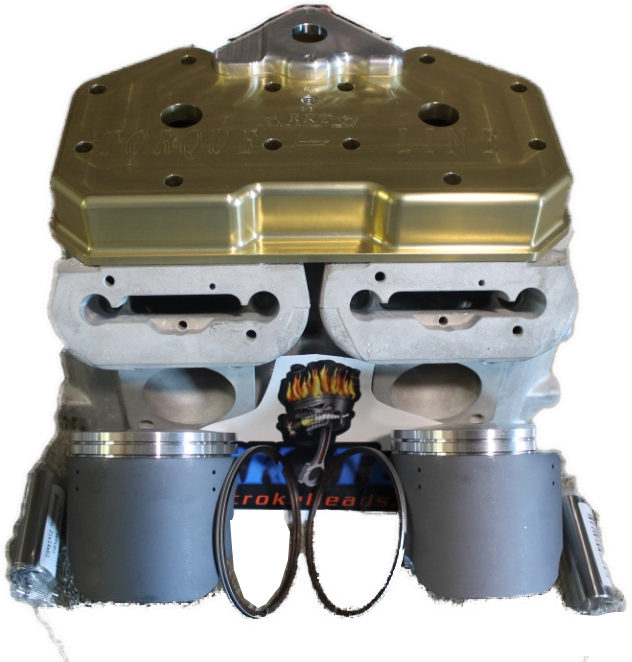 Couple that with a custom combustion chamber designed specifically for this engine and you have yourself a recipe for a very SOLID and POWERFUL power-plant that will NOT power-fade (heat soak) on a long pull. This kit is also MORE reliable than stock. In other words… It will perform better and last longer than your stock engine set-up!!! The new 860R from RK Tek is rated at 180HP on 91 octane fuel with the stock exhaust system. Peak power is accomplished at 8300 rpm. The torque curve is extremely broad and linear which allows for VERY easy clutch tuning. Fuel economy is INCREASED over the stock 800R due to the more efficient engine. The 860R is the “REAL DEAL” and will surely surprise and upset quite a few larger bore engines on the snow! NOTE: The ETEC 860 kit requires your stock head to be Modified. This LOWERS the cost of the kit by over $200 vs. the PTEK Kit. So, with carbs... you have a stronger "signal" at the carb (see Venturi Effect-->http://en.wikipedia..../Venturi_effect ) so you actually get MORE fuel passing thru the jet even if the jet is SMALLER..or the same size.. IF you need a bigger jet in an engine, then you have NOT increased the efficiency of the engine..,you can still be producing more power but the efficiency has not been increased (probably reduced). The EFI operates on supplied "inputs" that TELL the ECM that it needs more or less of "this" and "that"... where, again, the carb system is purely mechanical. So, with the advanced nature of the ETEC, it KNOWS if it needs more or less, and, in turn, supplies it.. BUT, there are limits to what it can do before running out of "smarts". This is exactly what we focused on with the 860 ETEC.. we made the engine more efficient so it would be able to remain "happy" in its given parameters! THIS is an RK Tek EXCLUSIVE and is PROPRIETARY to RK TEK! !